This 10-day circular trek through the Lake District starting from Windermere visits all the principal valleys using ancient trade routes and drovers trails, seeking out the lines of least resistance and making use of the passes between the mountains. The route can be walked by any moderately fit person. On five of the days there are options to take a more demanding high-level route between overnight stops, which will take in the summits of some of the highest peaks in the Lake District including Coniston Old Man, Helvellyn and Scafell Pike, England's highest mountain. We arrange comfortable accommodation in en-suite rooms at hotels and accredited guest houses on your route and we transfer your luggage so your bags are waiting for you when you arrive. Arriving in Windermere you are met at the Railway Station. Your baggage is transferred to your overnight accommodation in Ambleside while you set off on the first leg of the Tour, a gentle stroll with little in the way of ascent after the initial climb up to Orrest Head, which is a classic viewpoint for the lake. The rest of the walk is mainly level or downhill following quiet paths and country lanes which take you through woodland and beside tumbling streams leading eventually to bustling Ambleside. 6½ miles. 1150ft. ascent / 1375ft. descent. Today's walk begins with a crossing of the broad shoulder of Loughrigg Fell to the beautiful setting of Loughrigg Tarn before descending to Skelwith Bridge and on to the quintessential Lakeland hamlet of Elterwater - the perfect place for lunch. This afternoon you travel through Little Langdale and below the Yewdale Fells to Coniston. 10½ miles. 1695ft. ascent / 1680ft. descent. An ancient drovers track, the 'Walna Scar Road' takes you from the Coniston Valley across the Furness Fells to the Duddon Valley and from there you follow Grassguards Gill up to the broad col between Ulpha Fell and Harter Fell before descending along Spothow Gill to the remote valley of Eskdale. 9 miles. 2740ft. ascent / 2670ft. descent. This alternative high level route first climbs the Old Man of Coniston for far-reaching views over the Lakeland Fells before descending to Seathwaite Tarn. You cross the upper reaches of the Duddon by way of stepping stones and climb up to Hard Knott Pass, where you visit the well preserved Roman Fort. Finally, a descent into the Eskdale Valley with views to the west coast brings you to your overnight accommodation. 10½ miles. 3375ft. ascent / 3325ft. descent. The day starts with an easy walk following the River Esk downstream to pretty Eskdale Green. From here you climb through woodland to cross the hidden gem of Miterdale and then across Irton Fell to the magnificent Wasdale Valley. Here you have a choice of an easy walk beside the road which follows the western shore of Wastwater, or the crossing of Wasdale Screes on the quiet eastern shore. Either way, you arrive at Wasdale Head, the home of English rock climbing and 19th century gentleman's alpinism. 7½ miles. 1710ft. ascent / 1700ft. descent. Today's high level alternative is a sensational mountain day climbing England's highest peak, Scafell Pike by its finest route and then descending directly to Wasdale Head. 9½ miles. 3340ft. ascent / 3330ft. descent. There are a couple of tough climbs to make today as you cross the watersheds separating three major Lakeland valleys. From Wasdale, you first climb up to Black Sail pass to cross into lonely Ennerdale and then over the Scarth Gap below Haystacks to reach Buttermere, arguably the loveliest of all Lakeland Valleys. 7 miles. 2425ft. ascent / 2280ft. descent. A sensational way to link the valleys of Wasdale and Buttermere, collecting several Wainwrights along the way. From Wasdale Head you take the trail up to Sty Head pass from where you make the challenging climb of Great Gable. A roller coaster day then takes you over Green Gable, Brandreth and finally Haystacks before dropping via Scarth Gap to Buttermere's lake and following the shoreline to your accommodation in Buttermere Village. 9 miles. 3565ft. ascent / 3425ft. descent. A varied walk which climbs beside the Sail Beck to leave Buttermere and then descends Rigg Beck into the Newlands Valley. The day ends with a descent of Newlands through the villages of Stair and Portinscale to the bustling' Outdoor Adventure Centre' of Keswick. 9 miles. 1590ft. ascent / 1720ft. descent. A simply delightful stroll starting with a walk beside the River Greta out of Keswick and then through the charming village of Portinscale before following the Cumbria way along the quiet wooded shores of Derwentwater to Grange. From this pretty little village at the southern end of the lake, you meander with the river Derwent through woods and hillside to reach Rosthwaite deep in Borrowdale. 8 miles. 580ft. ascent / 555ft. descent. There is more climbing to do today with some sensational scenery as you cross the watersheds between Derwentwater, Thirlmere and Grasmere. From Rosthwaite you follow the route of Wainwright's 'Coast to Coast' path, leaving the confines of Borrowdale along the Stonethwaite beck and climbing towards the impressive Eagle crag. Crossing the watershed of Greenup Edge you then descend alongside Far Easedale Gill to the quintessential Lake District village of Grasmere. 8 miles. 2484ft. ascent / 2516ft. descent. Today you cross the impressive Eastern Fells taking advantage of a rare breach in the ridge-line between the lofty summits of Helvellyn and Fairfield. Grisedale Hause with its pretty mountain tarn was once an important trade route between the villages of Grasmere and those of the Ullswater Valley. Crossing the pass you descend the beautiful valley of Grisedale to your accommodation. 7½ miles. 2125ft ascent / 1860ft descent. A sensational mountain day beginning with the ascent to Grisedale Hause from where you gain the main ridge-line of the Eastern Fells at the summit of Dollywagon Pike (2810ft). A traverse of the long ridge separating Thirlmere from Ullswater over Nethermost Pike (2920ft) leads to Helvellyn (3118ft), England's third highest mountain. From the summit a descent of Swirrel Edge above glittering Red Tarn and of Birkhouse Moor into the Grisedale Valley brings you to your accommodation. 10 miles. 3685ft. ascent / 3425ft. descent. A fitting finale to the Tour of the Lake District, this full day in the hills will take you through all the varieties of Lake District scenery encountered on your tour, past picturesque Lakeland villages, beside tumbling streams, over bracken-covered hillsides, along sinuous fell ridges and across rocky passes rising above deep glacial cwms, and all with superb views of peaks and lakes. At the end of the day you return again to Orrest Head for a final overview of the Lake District before you make your descent to Windermere. 12½ miles. 2380ft. ascent / 2455ft. descent. In good weather, this high level alternative finish to the Tour of the Lake District involves an extra thousand feet or so of toil but is well worth the effort for the magnificent elevated position afforded by the long ridge of High Street named after the Roman Road which was built along here to link the forts of Ambleside with those to the north and eventually Hadrian's Wall. 13½ miles. 3450ft. ascent / 3520ft. descent. Let us know if you would like us to arrange a transfer to Windermere station. Windermere station is the terminus of a branch line from the main North-West London to Glasgow rail link (change at Oxenholme). Alternatively, if you are arriving by car it is usually possible to arrange parking for the duration of the walk (possible extra charge). 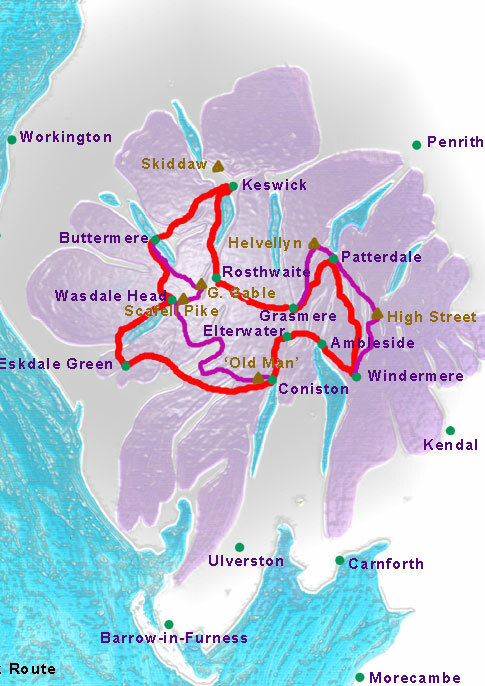 The Tour of the Lake district generally follows valley routes and crosses between them using mountain passes (red route) and is therefore not a high graded walk. There are options on five of the days to complete a high level circuit (purple route) and the Tour will be more challenging if you take advantage of any or all of these.